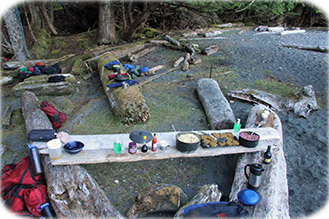 This page describes the meals provided on our wilderness kayak journeys. Our accommodation tours offer a different menu. The Kayak Mothership Cruise and Kayak Guesthouse Vacation each include meals prepared by professional chefs who work in a well equipped galley or kitchen, while enjoying access to an even wider variety of ingredients. 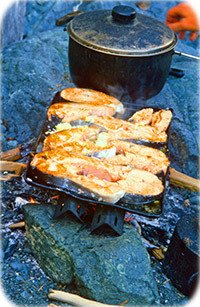 The meals prepared on our wilderness kayak journeys are healthy, tasty and abundant. We cook wholesome "slow food" over driftwood campfires and enjoy our onshore time. Butterfly Tours provides several organic ingredients. Our guide Gord is an excellent chef, with decades of professional campfire cooking experience. Meals are of a vegetarian nature, with the possibility of adding freshly gathered seafoods. Professional campfire cooking provides an entirely different wilderness experience compared to heating food over a propane stove. Our meals are skillfully prepared over a small driftwood fire on the beach. We prefer the distinct aesthetic benefits achieved by cooking over a campfire. Cooking our meals over a fire brings us all closer to the ancient ways of the Haida, who once paddled their cedar canoes through the region. The fire becomes our gathering place each morning and evening. Guests are encouraged to participate by collecting a few small pieces of driftwood to fuel our campfire. Effective campfire cooking may be considered a practical and intricate art form. 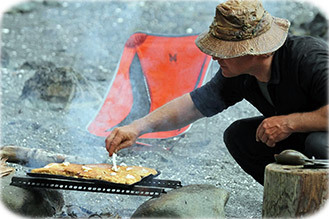 Wilderness experiences are continually enriched as a result of our guide's refined campfire cooking abilities. Other outfitters have larger groups and use double kayaks loaded with heavy propane tanks, folding tables, multi-burner stoves and ovens. We offer the considerable aesthetic benefits of smaller groups, single kayaks and professional campfire cooking. While planning each meal, we take into consideration the weather, the day's route and the supplementary food items we may have gathered from the sea. Gord has spent decades perfecting many outstanding recipes. He earns steady compliments for his attention to details and his talents with the spice kit. Meals are well balanced and wholesomely satisfying. Our nutritious food, combined with daily exercise and fresh sea air, helps to maintain a steady feeling of well-being during the trips. For breakfast we serve a number of different dishes. Our choice often depends on how soon we wish to begin paddling in the morning. There is always the choice of herbal tea, black tea or strong coffee. We serve shade-grown & fair-traded organic coffee, dark roasted by the Just Us! Co-op and made fresh each morning in our stainless steel insulated french press. On lazy mornings, we collect several pieces of slow-burning wood to cook our 10-grain pancakes. The pancakes are served with European cultured butter and pure organic maple syrup from Quebec. On days when we choose to rise early to catch a morning tide, we serve an ever-changing variety of cooked breakfast grains including; organic millet, semolina, 7-grain cereal, cornmeal and our popular rice pudding. We mix the grains to create new combinations and add dried mangos, papayas, apricots, cranberries, currants plus roasted cashews and almonds. Spiced with cinnamon and nutmeg, served with milk, brown sugar or honey, the cooked breakfast grains provide a warm and delicious start to our day. Lunch consists of a variety of toppings to spread on European rye bread, multi-grain bagels, dark Dutch pumpernickel and crackers. For toppings, we provide medium gouda and smoked gouda cheeses, salmon spread, pickles, hummus, smoked oysters, cucumber, salami, mustard, almond butter, jams and chocolate hazelnut spread. Apples, oranges and juices are served with lunch. If we have cool weather, we may build a campfire and prepare hot soup, or spiced salmon-cheese melts. A staple for dinner is our organic brown basmati rice. We mix it with wild rice or black Thai rice and sometimes cook it with wedges of dried pineapple for a tropical flavour. The rice is served with a wide variety of uniquely garnished vegetarian soups and sauces. Also on the dinner menu are falafel and cous cous with a Waldorf salad, and authentic Italian pasta with our carefully crafted red sauce. Dinners may include freshly caught fish; we often land lingcod, rockfish & greenling and we could be fortunate enough to catch salmon, or even halibut. If the opportunity presents itself, we may sample a few morsels of fresh sashimi with wasabi and soy sauce. When you catch a fish, we may immerse the fillets into our popular maple, soy & garlic marinade, before grilling it over the fire. Gord may create his famous "Jum" - a rich chowder full of potatoes, vegetables, shiitake mushrooms and an impressive list of delicious additions. Jum is the Haida word for fish stew and it is always a big hit. The dessert menu includes our own blend of rich, dark hot chocolate, as well as peaches & cream. We provide wholesome and tasty meals; however, it is not always possible for us to cater to an individual's specific food preferences. Participants on our wilderness kayak journeys who have special dietary requirements are asked to provide their own preferred menu items suitable for campfire cooking. Alternatively, our accommodation tours are capable of catering to a wider variety of dietary requirements. If you require specific foods, or are entirely unable to eat certain foods, please contact Gord to request more information before registering on a trip. Butterfly Tours' food provisions have been carefully refined for effective and efficient packing and caching. To maximize each kayak's seaworthiness, we minimize deck loads by placing all heavy or bulky items inside the watertight hatches. This lowers the centre of gravity of each vessel while increasing stability and reducing wind resistance. Additionally, we hang our food at night to prevent wildlife from pilfering our supplies. Some other outfitters have been known to launch with top-heavy deck loads and risk leaving food in their kayaks overnight. For more information on food caching, see Gord's article; published online by Parks Canada.